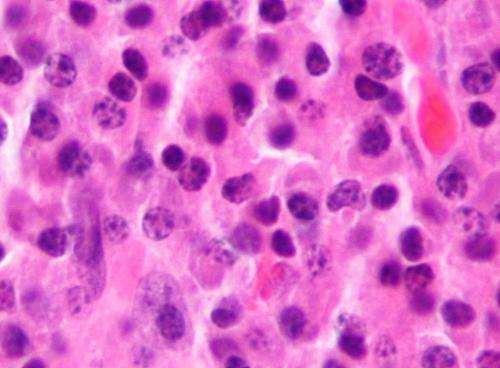 Bone marrow biopsies are the gold standard for diagnosing and monitoring the progression of multiple myeloma, but these procedures are far too invasive to perform at every patient visit. Scientists from the Dana-Farber Cancer Institute and the Broad Institute of MIT and Harvard, however, have shown that two ways to measure multiple myeloma DNA in blood samples provide highly detailed sets of genetic information that agree well not just with each other but with results from bone marrow tests. "Until now, we haven't had a good way to measure how multiple myeloma cell populations evolve from precursor stages to diagnosed disease, and then respond to treatments, says Irene Ghobrial, MD, a Dana-Farber medical oncologist. "This is where blood biopsies can make a huge difference—extending our understanding of multiple myeloma, and really giving us a timeline of how the disease progresses and responds to therapy." The collaborative research examined blood biopsies that gathered multiple myeloma tumor DNA from two sources. One is circulating free DNA (cfDNA), scraps of DNA released into the bloodstream by dying cells. The other is circulating tumor cells (CTCs)—myeloma cells themselves. "Our discovery that cfDNA and CTC analyses agree with each other at the comprehensive level is an important finding, because this means that routine genetic profiling of patient tumors from blood would be feasible," says Ghobrial, co-senior author on a paper reporting the work in Nature Communications. The blood biopsy analyses followed a two-step sequencing approach, says Viktor Adalsteinsson, PhD, group leader of the Blood Biopsy Team at the Broad Institute and co-senior author on the paper. The first step, developed by his team and called "ultra-low pass" whole genome sequencing, was a cost-effective method to identify blood samples with tumor DNA fraction of at least 5-10%, allowing more comprehensive genetic analysis. In the second step, the researchers performed whole exome sequencing (analyzing the protein-coding regions of the genome) on those samples. The investigators examined cfDNA from 107 patients and CTCs from 56 patients. The scientists then matched up cfDNA with bone marrow data from nine patients, and compared all three forms of biopsy in four additional patients. Overall, the gene profiles overlapped closely—demonstrating about 99% agreement between liquid and bone marrow biopsies for tumor gene mutations, for instance. Such high levels of agreement suggest that the two forms of liquid biopsy might be used interchangeably to track patients with multiple myeloma, the researchers say, and employing both techniques might further increase the chances of understanding the disease in each patient. It's also possible that blood biopsies will offer more comprehensive genetic information than bone marrow tests, says Salomon Manier, MD, PhD, co-first author on the paper and a former graduate student in the Ghobrial lab. Knowing the entire genetic spectrum of disease is crucial to individualize treatment, especially given the growing number of therapeutic options for multiple myeloma, Manier points out. But bone marrow biopsies collect cells from just one location, so those tests can miss nearby cells with quite different characteristics. "We can't do personalized medicine with a single bone marrow biopsy," he says. "We need these blood biopsies to help guide treatment, because patients' tumors change over time." The investigators emphasize that results of their study must be confirmed in larger patient cohorts, now ongoing, before blood biopsies can be brought into clinical use. Among their next steps, the scientists aim to develop methods that provide more detailed and clinically appropriate genetic information, and to hone techniques that work in blood samples with lower fractions of cancer DNA. "Our ultimate goal is to eventually use all the samples to monitor disease progression," says Jihye Park, PhD, researcher in the Ghobrial lab and co-first author on the paper. "The technology is basically there, says Ghobrial. "Our patients are so excited to see these tests, and now we need to develop clinical tools that become part of routine testing." "These noninvasive techniques can really open the door for longitudinal study of cancer evolution and progression," says Adalsteinsson, whose group pursues many projects to comprehensively sequence solid tumors as well as blood cancers. "We believe it's important to look broadly at a patient's cancer genome and how it changes over time—to identify not only the known actionable mutations of today but also to discover new ones that will inform better and more effective treatments of tomorrow."